I would like to wish everyone a very happy Thanksgiving. Although the holiday has been celebrated since the pilgrims landed at Plymouth Rock, it didn’t become a nationally observed holiday until 1863. 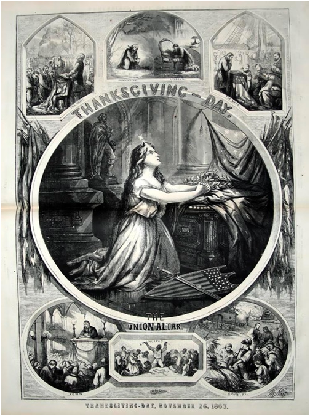 The last Thursday of November was proclaimed a national holiday by Abraham Lincoln on October 3, 1863, thus commemorating “a day of Thanksgiving and praise to our beneficent Father who dwelleth in the Heavens.” It took nearly a century before some cities in the South, such as Vicksburg, Mississippi, finally acknowledged the holiday. Only a week earlier, on November 19, 1863, President Lincoln traveled to Gettysburg to dedicate a national cemetery that was being established to bury Union soldiers who had met their demise there. After delivering his famous Gettysburg Address, which he considered to be “a few appropriate remarks,” he was overheard saying, “I failed, I failed, and that is about all that can be said about it.” This was because of the poor reception he received following his speech, but little did he know that his words would become one of the most famous addresses in American history. With that, let us all give thanks for what we are blessed with. Sometimes it is difficult to perceive the blessings we receive, just as Mr. Lincoln failed to perceive the potency of his words at the time. Many have friends and/or family who are dealing with the loss of loved ones or other critical situations in their lives. During this holiday season, please pray for them, as well as our military personnel. One-hundred-and-fifty years later, a live cannonball turned up at Richmond National Battlefield Park as crews were clearing a moat in preparation for an interpretive tour at a Civil War fort.The shell, thought to be a makeshift hand grenade, was discovered within the moat of a Confederate fortification known as Fort Gilmer in the park’s Fort Harrison Battlefield unit. The site was being readied for an interpretive tour of Fort Gilmer on September 29 that would mark the 150th anniversary of the fighting there. The cannonball, still displaying an intact fuse, was safely removed by the County of Henrico Police Bomb Disposal Team and destroyed at the county’s firing range. Park historians determined that the shell was a 12-pound explosive round, possibly used by Confederates at Fort Gilmer as one of several improvised hand grenades rolled down the side of the fort against Union soldiers from the 7th United States Colored Troops. The USCTs were part of a Union force moving against Fort Gilmer in the latter phases of the Battle of Fort Harrison. Park historians note that the Confederate defensive effort had its desired effect; of the 198 USCTs who began the attack against Fort Gilmer, only one returned safely. The other 197 were killed, wounded, or captured. Last year, my novel, A Beautiful Glittering Lie, won the John Esten Cooke Fiction Award. This is a special honor bestowed to novels about the Civil War that discuss the Southern perspective. It is given by the Military Order of the Stars and Bars, a prestigious organization that was founded after the war by Confederate officers. Over the years, many books have received this award. However, it is not awarded annually, which makes it that much more special. Please show your support by posting a review on Amazon and/or Barnes and Noble’s websites. I sincerely appreciate your ongoing support, and I hope you will continue to read. Thank you. 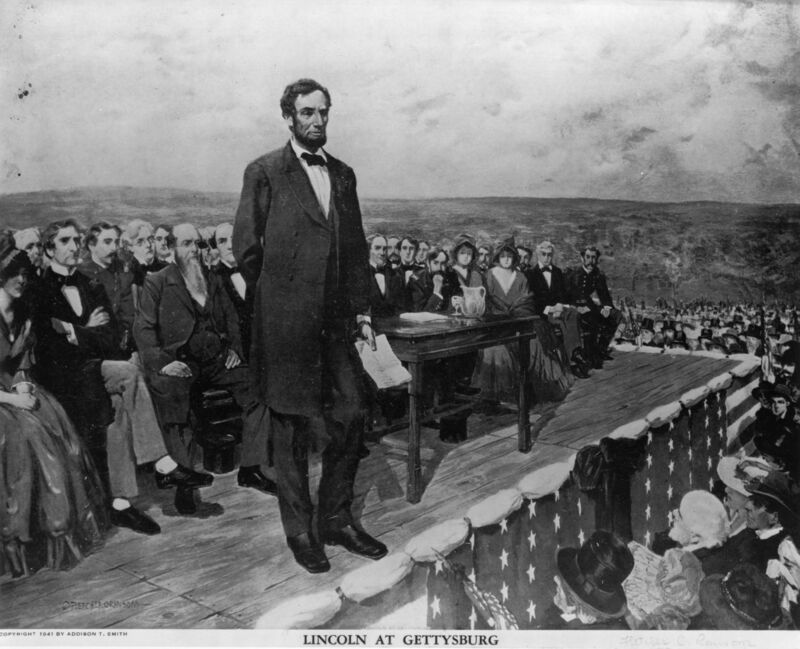 One of the greatest American speeches ever delivered took place on this date in 1863. Following the bloody Battle of Gettysburg on July 1-3, 1863, President Abraham Lincoln was invited to participate in dedicating the Soldiers National Cemetery to say “a few appropriate remarks.” After a long, two hour oratory given by Edward Everett, a popular speaker of that time. President Lincoln rose to his feet, stepped to the front of the platform, and began reading. His speech lasted just over two minutes, but it has endured through the ages. Once he was finished reading, the audience responded with only a spattering of applause. Lincoln remarked that his carefully chosen words fell on them like a wet blanket. Little did he know, his speech would become one of the most famous, reverent speeches in this country’s history. Today marks the 150th anniversary of the beginning of the end for the Confederacy in the Eastern Theater. 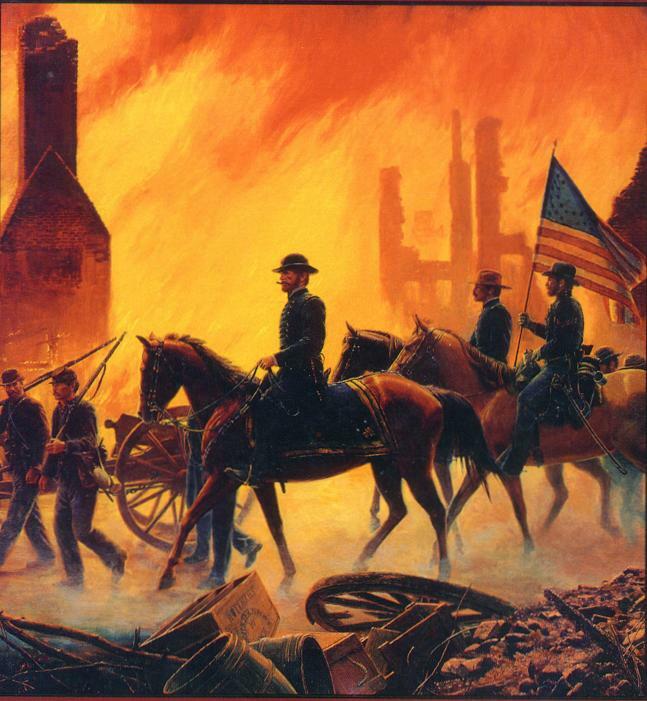 On November 15, 1864, Major General William Tecumseh Sherman led his Union troops on a rampage, sweeping through Georgia while reeking havoc, destruction, and terror on the citizens of the state. It was Sherman’s idea that war should be inflicted on the weak and innocent: no one was immune. “Total war” began two months earlier, when General Philip Sheridan’s Union army stripped the Shenandoah Valley of its resources. Sherman’s orders were not strictly enforced, so many “bummers” took advantage of defenseless civilians. Margaret Mitchell’s classic “Gone With the Wind” portrays Southern characters engulfed in the trials of the tumultuous “march,” particularly those of Scarlet O’Hara. Veteran’s Day was originally established as Armistice Day, when the Armistice was signed ending WWI. Major hostilities were ended on the eleventh hour of the eleventh day of the eleventh month of 1918. President Woodrow Wilson declared it a holiday in 1919. In 1953, the idea was spread to include all veterans, changing it from Armistice Day to “All Veterans’ Day,” and in 1954, President Dwight D. Eisenhower signed the bill into law. All states within the United States observe this holiday. National ceremonies take place every year at the Tomb of the Unknown Soldier in Arlington National Cemetery. The day will be celebrated with parades, speeches, and observances of our beloved veterans. So if you know someone who has bravely served in defense of this great country, give them a heartfelt thank you. And if they are one of the few remaining veterans who fought in WWII, give them an extra special hug. Without these men and women, our freedom would be lost. GREAT NEWS! 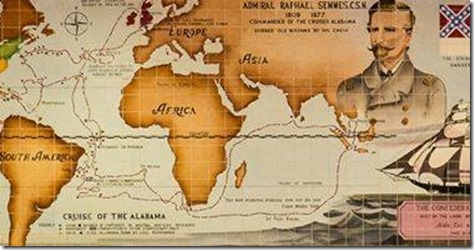 The CSS Alabama/Adm. Semmes mural that was in the east bound Alabama Welcome Centre at the Mississippi line has been saved from the scrap heap of memories. The Semmes family took possession of this heritage art and we can’t say thank you enough to this family for their efforts in preserving the legacy of our heroes. I know that lots of you, like me, made many a stop at the welcome centre just to see this mural. 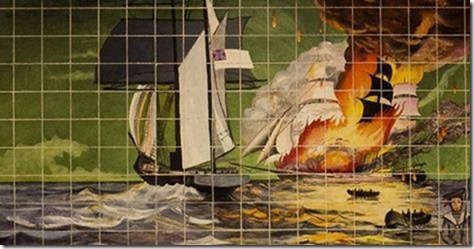 Plans are being made to display the mural in Mobile. Is this exciting or what? 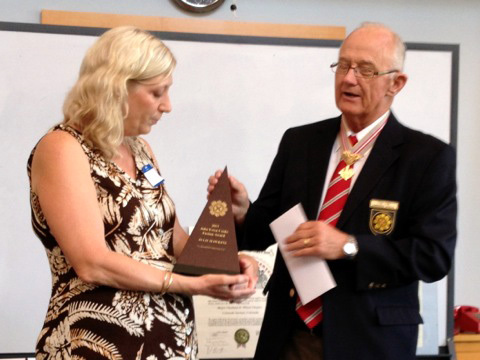 President, 290 Foundation (BVI) Inc.
My Son’s Video is Trending! Yesterday, a video my son, Jesse Hawkins, and his friend, Richard Annett filmed went viral. Today it’s trending! I’m so proud that I had to post it. Hope you enjoy!